What is this feeling, so sudden and new? My excitement at seeing Wicked again, that’s what! 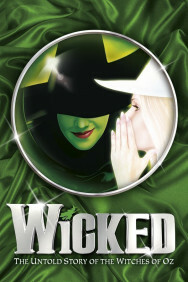 Kerry Ellis returns to this record breaking show in a blaze of green glory. In my mind, a show like Wicked needs no introduction; it’s hard to imagine walking through London Victoria without seeing the eye-catching green signs adorning the Apollo Victoria Theatre. After winning over 100 international awards and defining the careers of many musical theatre performers, I have to remind myself that Wicked has only been around for 9 years. But like any musical, it often goes through cast changes to keep the performances fresh. So I went along to watch this spectacle once again but now with a new leading lady playing the green witch Elphaba herself. The previous star Willemijn Verkaik, having played the role around the world for 7 years, left the show early for medical reasons and for a limited time has been replaced by Kerry Ellis. Ellis previously played Elphaba in 2006, taking over from the role’s creator (and arguably most famous star) Idina Menzel. So, with a famous musical theatre name back on stage, my expectations for the show were at their highest. I was not disappointed. With a famous musical theatre name back on stage, my expectations for the show were at their highest. I was not disappointed. For those that haven’t jumped on the bandwagon and know everything about Wicked already, the story tells the events of The Wizard of Oz from a different perspective. Elphaba (Ellis), the green protagonist of the tale, joins Shiz University to take care of her disabled sister. She ends up sharing a room with Glinda (Savannah Stevenson) and as polar opposites the two take an instant dislike to each other. But circumstances throw them together and eventually, as firm friends, they are granted an audience with the Wizard of Oz himself. This fateful encounter sees them choose very different paths that eventually lead to opposing sides as Glinda the Good and Elphaba the Wicked Witch of the West. Of course, nothing is as simple as it seems. Based on Gregory Maguire’s novel, the script cleverly introduces the idea of wickedness as simply a matter of perspective in a family friendly setting. I also love that it teaches the younger generation to be less focussed on looks and more on what’s inside, something that in today’s society we could all do with being reminded of from time to time. The two leads of Elphaba (Ellis) and Glinda (Stevenson) are both completely opposite in character but equally impressive to watch. Ellis is strong and slightly cynical as Elphaba, the girl who has fought all her life to be taken seriously and not be seen as a freak. I was expecting to be most impressed by Ellis (given her career pedigree) but actually found myself more excited by Stevenson. She had impeccable comic timing and showed the whole range of emotions throughout the story, from the spoilt little rich girl that pouts and smiles at all the right moments to the mature public figure that realises just how much she has sacrificed for her fame. Ellis and Stevenson also had absolutely faultless voices – the songs of Wicked are some of the most well-known in the West End today (thanks to Stephen Schwartz), so any mistakes are glaringly obvious. The show has a beautiful combination of ballads, up tempo songs, comedy duets and solo performances, all in a Disney/ pop princess style. This particular ensemble was vocally one of the strongest I have ever seen in a musical – no-one was a note out of place. This particular ensemble was vocally one of the strongest I have ever seen in a musical – no-one was a note out of place. Ellis and Stevenson both led from the front here, with incredible duets (‘What Is This Feeling’ was my favourite) and solo songs alike. Glinda (Stevenson) was funny and sassy in ‘Popular’ whilst Elphaba (Ellis) in ‘No Go Deed’ absolutely stole the show for me with a powerful and emotionally heartbreaking vocal. The supporting roles were all also really strong singers, a rare sight for even the best of West End productions. Nessarose (Katie Rowley Jones) was light and delicate in her top register, whereas Madame Morrible (Sue Kelvin) had a deep and commanding lower voice combined with a diva personality. Even the men (who have often let this production down) were up to scratch, particularly Fiero (Jeremy Taylor) who, as the main romantic interest, was strong and passionate in the songs that needed it the most. I loved the interaction between Fiero (Taylor) and both of the leading women; there were scenes where Taylor’s acting was the equal of Ellis and Stevenson and so you almost forgot that he was a supporting character. Of course no review of Wicked would be complete with mentioning the set and costumes – Eugene Lee and Susan Hilferty (respectively) transform the whole theatre into a magical world. The Emerald City is particularly striking – the set is a blaze of green sparkle that creates a dazzling effect and matches the costumes of the city’s residents to a tee. Overall, the whole experience is exactly as I expected and Kerry Ellis slots back into her role like she had never left. If you haven’t seen it already, put this show to the top of your list! If you love London Theatre in all its variety, size, shape and form there’s always plenty explore beyond the bright lights of the West End. One venue you might like to check out is Theatre 503 in Battersea, South London, particularly if you’re interested in new writing. Dance now wherever you may be! Michael Flatley may have given up his crown as the Lord of the Dance but I still watched this show in a state of childlike glee… for the most part. 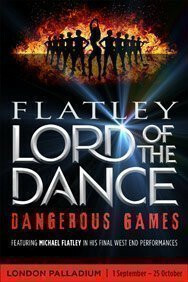 I remember being 5 or 6 years old and dancing round the living room to a VHS tape of Michael Flatley’s ‘Riverdance’. Of course at the time I thought I was as good as the man himself, but even then the poise and precision of the dancers, the beautiful Gaelic music and the almost ethereal costumes always held a magical quality for me. So when I entered the London Palladium to watch Lord of the Dance: Dangerous Games, all of those memories came flooding back. All show reviews are written by independent theatregoers, directors, or actors. All views expressed in these articles are those of the authors and do not necessarily represent the views of London Box Office.